Glenn Hoddle played for Tottenham Monaco and England from the mid-seventies through to end of the eighties, and later graduated to be England manager in the late nineties. He was skilful, intelligent and perceptive as a midfield playmaker, but less so as a manager. Although his playing career was interrupted several times by injury, he amassed 52 England caps between 1979 and 1988, and was a first pick for many teams. But Hoddle was never able to carve out a position that was definitively his and never seemed to gain the backing of the managers he played under. Glenn Hoddle made his debut against Bulgaria in a European Championship qualifying match in 1979 and scored with an exquisitely taken goal. Without breaking his stride he took the ball on the volley just outside the penalty area and stroked it into the net. Although this wasn't immediately spectacular, two aspects of this goal characterise the way Hoddle played football. Firstly, he simply passed the ball into the net with precision rather than belting it straight at the keeper and secondly, it was completely unexpected and visionary. That the goal featured at number 32 of the top 50 England goals in Sky's 2005 poll also indicates the enigma of Hoddle: although superbly gifted, his style did not suit or please the English game. For the 1980 European Championship finals Hoddle was in the squad but only played in one game, the dead rubber against Spain, as England failed to progress past the group stage. Although Hoddle was always more about creating goals than scoring them, he scored another superb volley goal against Spain in a friendly in 1981 as the team warmed up for the 1982 World Cup in Spain. Unfortunately there was disappointment once more as England failed at the second round, Hoddle only playing in two early matches. The 1986 World Cup in Mexico was the next chance, as England didn't go to the 1984 European Championships, and although there were no goals for Hoddle, he played in every match and the phases where England controlled matches were the phases when Hoddle was in control. In the final match, the infamous defeat by Maradona's Argentina and his 'Hand of God' goal, Hoddle's free kick from 25-yards caused panic in the Argentine goal. England were 2-0 down at that point but it stirred the team and Lineker pulled one back ten minutes later and nearly equalised at the death. In 1988 England took the nucleus of the same team, still under Bobby Robson, to the European Championships held in West Germany, but couldn't get past the group stage, as the team who had been unbeaten in the qualifying matches imploded in the searing heat. Hoddle played in all three of the group games, which England lost, and they turned out to be his last for England. Seeking a better arena for his skills, Hoddle had left Tottenham for AS Monaco in 1987 until his retirement with a knee injury in 1990. He led them to European Cup success and Michel Platini said that if he had been French, he would have had 150 caps. England managers had been frustrated at his unwillingness to tackle back and perform defensive duties, and he openly admitted that he didn't feel that defending was an important job for him to do. After the knee healed Hoddle went to Swindon, then Chelsea as a player-manager, and in 1996 took up the England manager's job. The appointment was perhaps more about the creative and stylish play that Hoddle represented rather than out-and-out success, as he had won little as a manager up to that point, but the Graham Taylor years had taken their toll on the English football psyche. 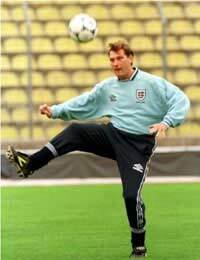 Hoddle took over from Terry Venables who had just lead England to another near success at Euro 96 but, ominously, was ousted for non-football reasons. Hoddle had two years to prepare and qualify for the tournament in France and did so, occasionally producing some stylish and confident football, but also some performances that were worryingly inept, displaying traditional English frailties. The first few of the 'golden generation' such as Beckham, Owen and Scholes got their chance under Hoddle, although he was careful not to play Beckham and Owen too early in the actual tournament. Many fans were concerned that Hoddle had dropped Paul Gascoigne, and with him missing, there was no-one who could turn a game with a piece of individual brilliance, but that was dispelled with Scholes' superb chipped shot from distance against Romania in the opener. There was intense pressure from the tabloids to play Owen and Beckham and some commentators feel that Hoddle gave in to that pressure. That may not be true, if stories of his steely determination are correct, but the press were proved dramatically wrong when Beckham's naïveté got him sent off halfway through the crucial quarter-final against Argentina. England's ten men hung on for the draw and had a perfectly good goal disallowed, but then lost on penalties. At the same time as this drama was being played out, the tabloid press, having got used to slagging England managers off in the Taylor years, had been niggling at Hoddle's spirituality and beliefs at every opportunity. His errors as an England manager were those of managing and relationships rather than poor coaching, and performances during his three years were no better or worse, overall, than many others. When an interview was published which made his beliefs on karma and reincarnation public, he was savaged, and the FA, in a re-run of the Venables fiasco, couldn't find the guts to back him. As with his playing career, Hoddle was misunderstood and paid the price.